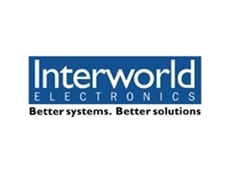 I-Server6015B-3B released by Interworld Electronics is a dual processor, 1U rack mount server designed with cutting-edge technology. 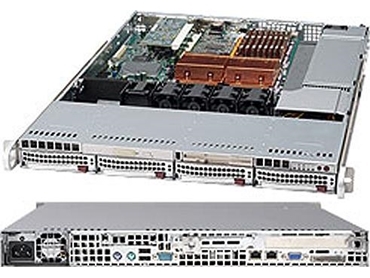 At the heart of the I-Server6015B-3B lies a dual processor Serverboard based upon Intel's 5000P chipset that supports two Dual-Core Intel Xeon 5100/5000 series or two Quad-Core Xeon 5300 series processors to provide a total of four or eight independent execution threads. The Serverboard has eight 240-pin DIMM sockets that can support up to 32 GB of ECC FBD (Fully Buffered DIMM) DDR2-667/533 SDRAM. The Serverboard provides two Universal PCI slots, each of which supports either one x8 PCI-Express card or one PCI-X 133/100 MHz card. One standard size expansion card and one low profile expansion card (with their appropriate riser cards) may be used with the server. A Serial ATA controller is incorporated into the ESB2 (South Bridge) portion of the 5000P chipset to provide a six-port 3 Gb/s SATA subsystem with RAID support. An onboard Adaptec AIC-9410 Serial Attached SCSI (SAS) controller in integrated into the Serverboard, which supports eight SAS hard drives with SES2. The SAS drives are connected to a backplane that provides power, bus termination and configuration settings and are hot-swappable. RAID 0, 1, 5 and 10 are supported. Again the 1U height of the chassis limits the number of hot-swappable SATA/SAS drives to four units. Note for users: The operating system used must have RAID support to enable the hot-swap capability and RAID function of the drives. Onboard I/O backpanel ports include one COM port, two USB ports, PS/2 mouse and keyboard ports, VGA port and two Gigabit LAN (NIC) ports. The onboard ATI ES1000 Graphics controller has 16MB video memory and supports high resolution displays. The front control panel on the I-Server6015B-3B provides important system monitoring and control information. LEDs indicate power on, network activity, hard disk drive activity and system overheat conditions. The control panel also includes a power button and a system reset button. The chassis features four speed controlled 40mm blower system cooling fans. The serverboard BIOS allows the fan speed to be determined by the system temperature to provide efficient and quiet operation. I-Server6015B-3B is supplied with a single 560W power supply.